The Harbingers of Repentance are a 12th founding chapter of the Dark Angels. Battle Cry: Before the sons of the Lion – Repent! The story of the Harbingers of Repentance begins in the hostile star clouds of the rarely spoken of sector Beetelgeuse where, in the late M33, the Imperium saw an increase in Xenos encounters. After a millennia and a half of peace Eldar and Ork raiders suddenly began ceaseless assaults the Imperial fleets transporting supplies between worlds, trading fleets began to disappear without a trace and whispers of terrors best unmentioned stirred the shadows. This far away from the heart of the Imperium of man fleets operated without the massive support of the ceaselessly working forge worlds, and, having worked for centuries not knowing of enemy threats, the mining colonies’ worker hives defences were undisciplined and neglected. Only when the plentiful tithes of rare Halonium ore ceased to arrive the Administratum opened their eyes to the events of the area. But then a millennium had already passed, and the Orks menace had spread throughout the system, only in check due to the improbable fall of the Warlord Mahall Garbachuff to lucky defensive artillery fire of the desperate defenders. The Eldar raiders had turned into Dark Eldar slave hunters and a Necron threat nearby was awakening. Here, the myriad events occurring leading to the need of additional numbers of Space Marines and consequently the 12th Founding shall not be discussed. But, the threat of losing the Beetelgeuse segment to the Xenos threats, and several rare Halonium sources with it, was among them; as at the time no force could comfortably stretch its resources to help out in the sector. The perspective of the Unforgiven to the founding of the Harbingers of Repentance deserves elaboration. It is little known that the 12th Founding occurred only a few hundred years after the recognition of Cypher’s Fallen associates on Nova Terra, 104.M35, among the solar systems of Beetelgeuse. In the early M34 a number of Fallen traces, and even singular evidence pointing toward the presence of Cypher, had led several hunts to the Beetelgeuse sector. All eluded capture as the hunting forces of the Unforgiven were intercepted by xenos fleets. It could soon only be concluded from what was learned during the dark interrogations of captured enemies that a number of Fallen were working on forging alliances with the xenos. Thus, the advent of the Harbingers of Repentance can be considered as a reaction of the Dark Angels to the events in the sector, hidden by the wider interests of the Imperium of Man, and pinning their existence to hunt of Fallen and xenos. The founding leaders of the chapter were drawn from the First Company, Second Company and Fifth Company of the Dark Angels. This resulted in very similar traditions as the mother chapter. Upon the founding of the Harbingers of Repentance a priority task was to seek and establish a home planet. Among the solar systems of Beetelgeuse one particular planet caught the chapter’s attention. It was the planet Gatsmaneh, the fourth planet from the central star of the solar system Gulgultha. Gatsmaneh is a lush death world with ancient forests, deep oceans and vast steppes; and great beasts roam these habitats as primary predators. What caught the eye of the Unforgiven was the great similarity to this planet and the great old Caliban. The planet had been occupied since the Dark Age of Technology. Old ruins of that age long lost can be found throughout the surface, penetrating through the earth as if through the fabric of time. But the advanced technology once had by the inhabitants is now lost. Late during the Great Crusade the inhabitants were found and reconnected to the Imperium; then only a feudal agricultural society was left on the planet. The small settlements were defended by stone walls manned by the leading Ealdormen’s forces armed with ancient las weaponry. The right to use the few plasma pistols and power cuirasses still left was earned by becoming a notable high ranking officer. With the support of the Imperium’s technology a new life sprung up on the planet, as medicine and resupplied weaponry helped the people defend against the great beasts. But after a reinstitution of the, as scans had shown that there was little resources to be mined, the planet was left mostly on its own. The people on the planet are a stubborn hearted folk, considered dour and silent by visiting traders. As a result of the poverty and the hardships caused by the planet’s climate the local culture has progressed towards the no nonsense, where the work for the common wellbeing is highly valued, and wastefulness is frowned upon, even unnecessary talk. Here the would-be-masters of the Harbingers of Repentance found themselves at home. The traditions of the Ealdromen’s clans resonated strongly with the tales of old Caliban – the very anecdotes told even before the Great Lion. It is unknown whether the prominence of technology on the planet, during the Dark Age of Technology was considered when a home world was chosen for the chapter. Nonetheless, the first chapter master, Orevon, the previous company master of the Ravenwing, had an interest in ancient technology, and often spent time in the libraries of the Rock reading of discoveries of ancient relic technology. Knowing the history of the new home world well, Orevon, soon conducted wide spectrum scans of the whole planet and several diggings in hope of discovering long forgotten archeotech. Found were only suggestions of the previous glory and indications of a highly advanced cloaking technology used to hide the remnants from prying eyes. Until this day the secrets of this cloaking technology has not been unveiled and many secrets lie hidden in Gatsmaneh’s soil. This personal interest of Orevon’s left its mark on the chapter, however, and records suggest several remarkable findings over the years in several parts of the galaxy. This gathering of sought for technology, together with the chapter’s silent nature, this has strained their relationship with the Adeptus Mechanicus. The Harbingers of Repentance’s fortress monastery Eben is found on the largest moon of Gatsmaneh. Here the obtained relic weaponry is stored for the use of the chapter. During the years Eben has been fitted with large fusion engines, massive archeo-shields and Gellar Fields to enable the Monastery to relocate if needed. Impressive batteries provide a defence comparable of the combined power of several fleets. The active core fuels the great machinery on the moon, every day closer reminiscent to a space hulk. The Harbingers of Repentance are a successor chapter descendant of the Dark Angels. Their gene seed is held sacred and monitored for any corruption. As such the blood of the Lion runs hot in the brothers’ veins, as uncorrupted as ever. Alike all Unforgiven the Harbingers of Repentance are stubborn, and fiercely loyal to their Brothers. Due to the ancient presence of great beasts on the death world Gatsmaneh, and the common raids in the sector occasionally hitting the Harbingers of Repentance’s home world, and their stubborn nature, the local population provide a good number of recruits. Due to the constant action of the chapter, and the number of casualties during the recruitment process, this number is rarely enough. A selected few planets in the Beetelgeuse sector helps the number of available recruits meet the need. The natives of the chosen recruitment worlds all live close with the earth and often share similar shamanistic beliefs. This culture has been incorporated in the recruitment rituals. The boys of the tribes and villages of the planets are all trained in the art of hunting from a young age. The most skilled hunters are picked out at the age of 8 with rituals, tests and competitions. Those deemed qualified then progress to become the warriors of the people who defend the settlements against wild animals and raiders. Out of these few, the Harbingers of Repentance choose the potential recruits using a psychic monitoring process. Two librarians are given the duty to probe the minds of the boys and observe the skills during the training from orbit. Those with a will and physique strong enough, and maybe even the psyker’s flaw, will be chosen for further evaluation. This choice is shared every third time the local sun is in aphelion, when those deemed suitable, if any, are sent dreams of a screeching Eagle leading them into the wild. To receive these dreams is considered a great honour, and a great celebration is held for the Dreamers, feeling the Screech of the Eagle. Following the clues of their dreams the chosen will find the way to the meeting grounds – their first contact with their new brethren. The similarity of the Father Chapter can also be seen in the chapter organisation. The first company is very similar to the Deathwing, with all members in terminator armour; the company also contains most of the chapter’s dreadnoughts. Similarly, members of the second company are usually fielded mounted, on either bikes or land speeders. The exact strength of these companies is not the usual 100 man, as for codex chapters – but rather undefined. The rest of the companies follows codex organisation closely. Remarkable for the company is also the strong presence of the Chaplaincy and Librarium in the company command. Overall the number of chaplains and librarians is significant, as a minimum of two positions of each are permanently designated to each company. This is needed due to the chapter’s ferocious chase of Unforgiven and Xenos; indeed, few missions are completed without a dozen or so captives, ruthlessly extracted for any information, and confessions. The armoury of the Harbingers of Repentance is wondrous indeed, as the work Orevon began in the beginning of the chapter has continued though the millennia. Among the most commonly used contemporary patterns of armour fascinating antique relics can be found; forgotten patterns of predators, personal shielding technology and venerable patterns of bolt weaponry, plasma- and meltaguns. Yet, the armoury is not a museum of old, but an actively used armoury of several of the greatest weapons the Imperium has fielded. Indeed it is not unheard of that brothers have the honour to don power armour of Mark IV and even Mark III. Yes, what value would these have if they would not be used to smite those who oppose the will of the Emperor and the lineage of the Lion? A large quantity of reliquary bionics has also been gathered for use by the chapter Apothecarion. It is not uncommon for brothers to be given the honour of carrying these bionics if his wounds gained in battle severely damages him. –the Power Maul of Interrogator Chaplain Uzziel, theFist of Remorse, which was used to destroy the Chaos Lord Ghaacax of the Soul Burners Legion. –the uniquely designed plasma pistol, Feller, which incapacitated a Fallen in the hands of the 4th Chapter Master, Hezekiah with a single shot through the spine. -a combat shield of the name the Swashbuckler’s Fate which protects the champion of the 5th company with remarkable potency. The Harbingers of Repentance maintain an active role in both defending the Imperium of Man against the threat of Xenos and Hereticus alike. Further, the Great Hunt for the Fallen demands mobility and speed. Thus, the chapter’s fleet required to be of a comparatively large size for a chapter of Adeptus Astartes. In the last decade, a long war of attrition against a wakening Necron dynasty mere few light years from the home solar system of the Harbingers of Repentance has left the fleet severely depleted. The power armour of the Harbingers of Repentance is green with the face mask of the helm, and the knee- and elbow pads in yellow. Yellow are also the backpacks. Veterans and sergeants, as well as many heavy weapon specialists, wear robes in white. The Brother’s company is indicated by livery on the left knee pad. Squad Markings are in red, while the chapter insignia – a very similar winged sword as their Founding Chapter, is in white. 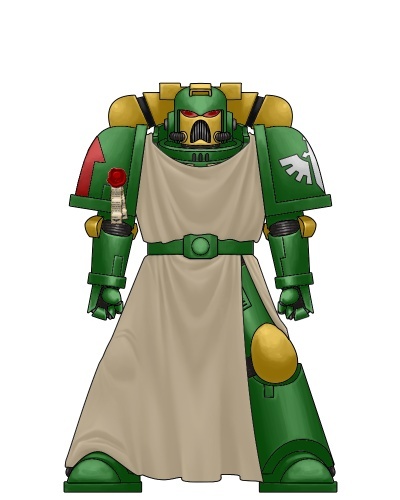 Terminator armour and the armour of inner circle members have the honour of bearing yellow armour with green robes. The exception to this is members of the Chaplaincy and the Librarius who wear, black and blue armour respectively. Mounted troops wear similar colours as their power armoured brethren, but wear yellow robes if rank permits. Apart from marking members of the combat police, special weapon specialists, the Harbingers of Repentance shun decorating their armour with more than prayers, purity seals and other “simple” honour markings. This is to punctuate the equality of all Brothers in the eyes of the Emperor. Fully introduced Brothers remember little of their past. Faces of their old family and friends fade with time as their new identity as Adeptus Astartes grow forth. Still, some memories of their past are tied into their minds so strongly, by emotion and survival, that they are nigh unforgettable. Such are for example the pre-battle rituals of their home planets in Beetelgeuse sector – so similar that they have become an important part of the chapter’s identity, together with the more traditional pre-battle chants of the Space Marines. In these rituals the brothers chant for the Emperor to embrace their spirits, ask for fortune from the spirits of Brothers passed on and painting their faces with war paint. The rituals culminate in the raising and anointing of the standard(s) that will follow the Brothers to battle. The number four is considered by the chapter to be a fortunate number – this can be seen in the war paint, usually done in four strokes, and chants, usually repeated four times, among other things. Feathers, especially those of different kinds of birds of prey, are often used as talismans and decorations. During battle the squads often sing low chants in an almost humming fashion, with the squad leader contra pointing with recitals. The chant is used to fortify the minds of the brothers to adamantium, and to instil fear in the enemy. Before the sons of the Lion – Repent! 537.M37 – The Harbingers of Repentance’s are ordered to staunch a wide spread anti–Imperial uprising on the planet Icartes IX. Leads direct the chapter to the tracks of False Prophet Karl Maronus. The first company strike at the heart of cultist’s cell and successfully destroy the leaders. The local Adeptus Arbites are left alone to calm the unrest. 004-013.M38 – Joining forces with a defending force of Vostroyan First Born, the Harbingers of Repentance successfully defend a Forge World against the Forces of Chaos. After the Forces of Chaos have been broken, and the chapter has left a trio of commanding officers are found missing. 244.M39 – The Harbingers of Repentance locate a Fallen that has been interacting regularly with a Tau Ethereal and his forces. After a short but intensive combat the the Tau force is massacred and several captives taken for further interrogation. The chapter later receives criticism from Terra for undermining negotiations with the Tau. 997.M41 – The First and 4th and 6th Company of the Harbingers of Repentance participate in the Third Tyrannic War beside Brothers from their Founding Chapter, and fellow Unforgiven. Together they are able to destroy a tendril threatening a cluster of major Industrial Planets. Currently the three companies of the Harbingers of Repentance are countering an Eldar pirate fleet threatening the home planet of the Chapter. The combined arms of the first, second and eight companies defend three Hive Worlds against the vanguard forces of the Waaagh!! of the Ork Warlord ‘Urghnould Blakkangur that is threatening to penetrate into the Imperium’s heart. Chapter Master Orevon was the first Chapter Master of the Harbingers of Repentance. Affecting the choice of homeworld and building the Fortress Monastery his influences formed the character of the chapter and the path it would take. The current Chapter Master Zepaniah is a silent man carefully planning all moves to the smallest detail, yet a still eternal fervour guides his actions. These characteristics combined with the ability to fearlessly make controversial and costly choices to ensure the greatest efficiency in battle makes him on of the greatest chapter masters the Harbingers of Repentance has seen to date. Master Librarian Giles currently heads the Librarius. Giles is a psyker of great power, but also a compassionate man that always understands the human factor in events. This makes him a great complement to the Chapter Master, able to show Zepaniah a very different perspective on most things. The chapter’s violent methods weigh heavy on him, but knowing of the duty it is a weight he carries stoically. Interrogator Chaplain Tsayad is a true legend of the chapter, and a hero most chaplains of the Unforgiven have heard about since he fell by the whips of a Dark Apostle of the Dark Prince during the final Battle of Blood Fang Nebula. During his day he earned three black pearls, and greatly developed the interrogation methods used by the Unforgiven.